We’ve had a busy week here at GL. The NGI hosted the Chancellor of the exchequer, George Osborne this week in the opening ceremony of the new institute in Manchester. It was an important occasion for the scientists and engineers of UoM, Graphene Lighting and the rest of the local graphene community. It was a chance to show off some of our latest work and we were very lucky to be the feature point of quite a number of articles. The NGI is Europe’s premier graphene research hub, the place where the whole story began so it’s great to see the first of, I’m sure many, prestigious visits. We worked very hard to get functioning prototypes of the graphene light bulb in preparation of the event and we’re proud to announce that we will bring it to market later this year. A few of the bigger outlets even used an image of the chancellor holding the bulb as their photo to lead the story. 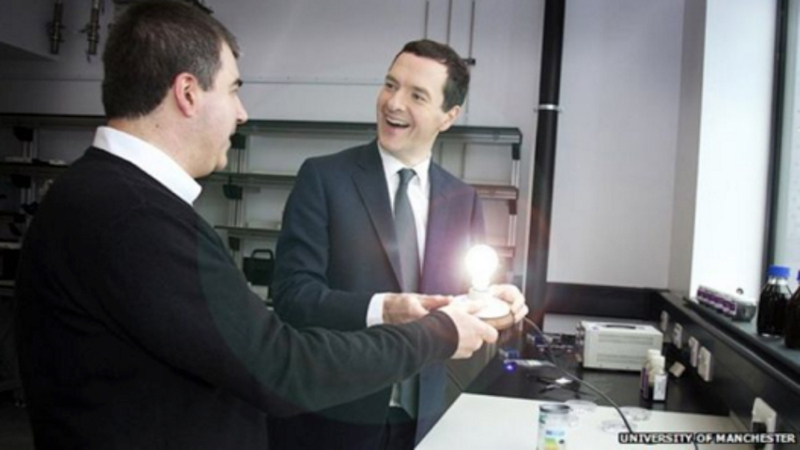 Kostya Novoselov showing the Graphene Lighting light bulb prototype to George Osborne. On the day security was pretty tight, we weren’t allowed to take part in the VIP tour of the facility, led by Prof Kostya Novoselov which is where he showed our bulbs to Mr Osborne. But afterwards we were let into the new seminar room on the 3rd floor with a good view of the wild garden which sits on the roof. Introduced by University President, Dame Nancy Rothwell, the chancellor spoke to the assembled engineers and press about the importance of graphene. Once the delegation had left, we were able to breathe a sigh of relief that everything had gone as planned but now the onus is now on us to get through the next round of pilot production. We’re trying to bring down costs and make sure we can bring the bulb to the public at the best possible value.